In October 2014, Community Literacy of Ontario (CLO) celebrated its 20th anniversary. We believed that the best way to celebrate our 20th anniversary was to honour the power, passion and impact of community-based literacy in Ontario! Why does literacy matter to you? How has literacy impacted your life? What are your hopes for literacy in the future? In response, Community Literacy of Ontario received letters, postcards, pictures, drawings, videos and poems from people all across Ontario. Thanks to sponsorship funding from Honda Canada, CLO was able to compile these submissions and create the “Love Letters” digital book. This powerful book celebrates what CLO and community-based literacy organizations have always believed in: the stories, voices, face and people whose lives have been touched by literacy. 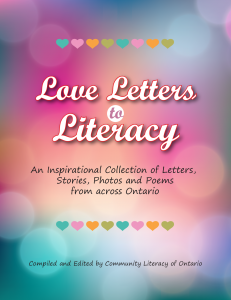 CLICK HERE to freely download our “Love Letters to Literacy” book.